Contact us for pricing and other questions about our rates. 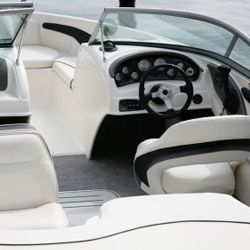 The detailing services of Bitter End Boatworks are designed to protect as well as renew weathered fiberglass and metal surfaces. 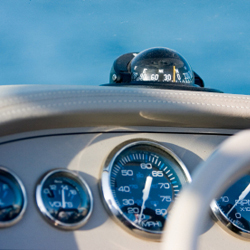 Whether your boat requires only a good cleaning and a yearly application of a UV protective wax or more rigorous compounding to remove heavy oxidation, our goal is to tailor our services to meet your specific needs, providing you with a lustrous, protective finish that enhances the longevity and beauty of your boat. Whether you require out-drive repair, a complete repower, or just routine maintainence, Bitter End Boatworks has the experience you need. Our technicians can service your boat at the dock, or more extensive repairs can be performed at our fully equiped repair facility. Should your disabled vessel need out of water service, we can provide towing and haul-out. We are qualified on gas or diesel engines of most makes, transmissions and outdrives. Get to your destination and back safely with service by BItter End Boatworks. 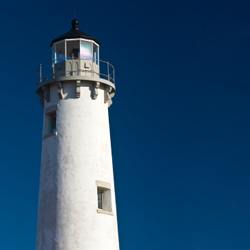 With a comprehensive understanding of ABYC standards and a respect for the harsh marine environment, we can deliver the electrical service you deserve. 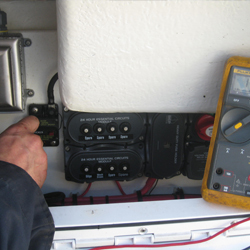 Bitter End Boatworks can perform diagnostic service, repairs, complete rewires, and install electronics of any kind. We also sell marine electronics at competitive prices and provide training on the electronics we sell. Bitter End Boatworks is the place to go for top quality bottom paint jobs! 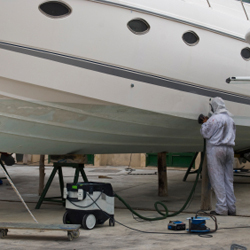 Our professional painters and varnishers achieve quality interior and exterior finishes through a comprehensive understanding of the issues that impact the durability and aesthetic of a boat's painted, varnished or oiled surfaces. Spar varnishes, teak oils, and one or two part polyurethane paint sytems are among the products that Bitter End Boatworks utilizes in their refinishing projects. 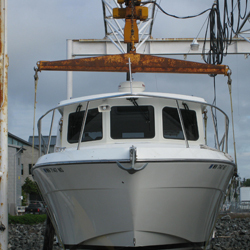 Do you have an old, weathered, or damaged boat that you just can't bring yourself to part with? Or is the sticker shock of replacing her completely out of the question? In today's trying economical times restoring or upgrading your old boat is probably the best and most cost-effective option. Let us work with you to restore her to Bristol condition. Our experience in the boat building industry combined with the completion of a series of challenging restorations over the past years has given us the skills and knowledge to efficiently and effectively address your boat's restoration needs. 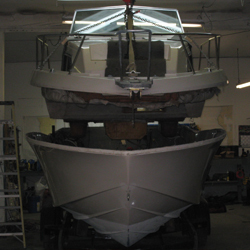 When it comes to restoring or upgrading your boat we have done it all many times. We have many satisfied customers who are happy that they made this choice. We capable of doing Haul-outs up to 30 feet at the shop. Haul-outs over 30 feet are also available. Owning a boat is a huge responsibility. Part of that responsibility is making sure that your boat is safe, secure, and properly looked after when not in use. But who has time for that? We know that many boat owners live or spend several months of the year away from where their boats are kept. This is why our boat watch program was designed specifically to alleviate this responsibility from your shoulders, so you can spend more time boating and doing the things you love. Obtain some peace of mind and sign up today. Servicing Blakely Island and Bellingham. 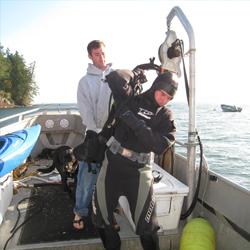 Bitter End Boatworks' certified divers have the ability to survey the condition of a vessel's hull, prop, and zincs and perform certain remedial as well as maintenance tasks while your boat remains in the water. We are also experienced in the inspection of docks, mooring buoys and other underwater structures including the examination and cleaning of ground tackle, mooring buoys and floats. We also handle a variety of other marine services including prop repair, canvas and upholstery, shrink wrapping, lower unit skeg replacement, dock maintenance and repair, winterizing, summerizing, and much more. We also have a constantly changing inventory of used boat parts for sale. 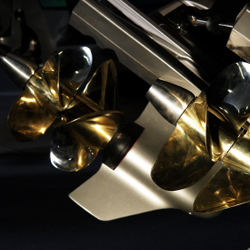 Please call us for any of your marine service needs.